Resolute, strong yet graceful, courageous, loyal, devoted, highly intelligent, versatile, bold, well-muscled but finely chiseled, fearless and watchful yet sensitive and caring companions to all ages of people- are just the beginning of some of the characteristics of the noble well-bred Doberman. For anyone who has owned one not only knows what I’m talking about, but has been spoiled for life. I have been truly blessed to have been raised in an environment of a kennel as a child, as my mother and aunt bred plenty of different breeds of dogs, but none of the breeds come close to what a Doberman has to offer. Someone once said that the Doberman Pinscher is the "Cadillac" of dogs. Most people who have owned Dobermans will agree... 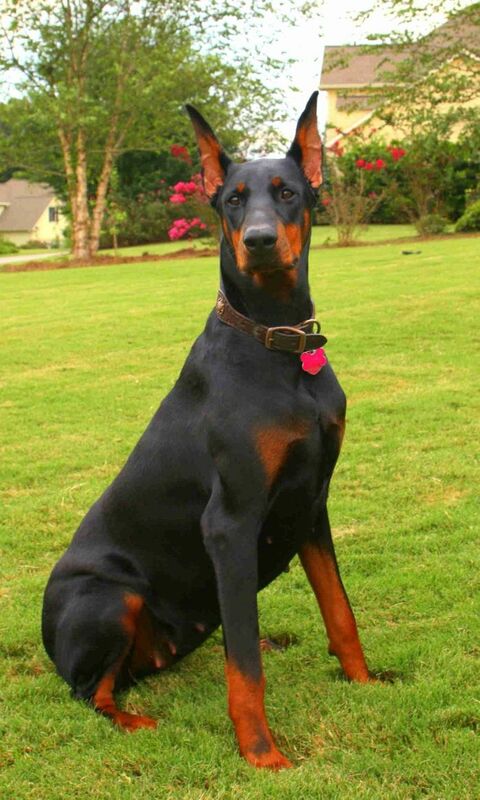 There are many other good breeds of dogs... and then there are Dobermans... "the dog of dogs". A Doberman is a affectionate animal, but his affection is noble. He wants to be close to you, to have your hand on his head, to rest his head on your lap, or to sit with his back to you pressing his body as close to yours as he possibly can. He owns you and he wants you to know that he enjoys this role. He is glad that you belong to him. The Doberman is an obedient dog. Today, those who want a great performing dog in obedience trial work usually turn to Dobermans. As one top professional trainer and exhibitor says, "In obedience, a top working Doberman can be topped only by another Doberman. No other breed can compete for cleanliness, speed, and performance.